Boy, are there a lot of these books out there. Big ones, small ones, fat ones, tall ones, each with its strong points, but none as good as this. The book uses a marvelous combination of brilliant photos, color sketches, and line drawings to fully explain the varied elements of landscape design. Most important, the engineering aspects involved when installing some of the more demanding elements of a landscape are succinctly explained and diagrammed. 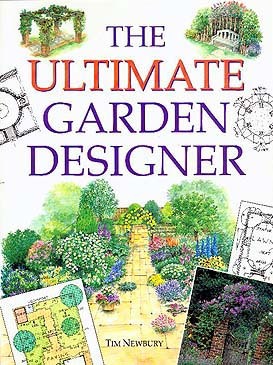 The author chooses wisely to break the book into many chapters (Cottage Gardens, Kitchen Gardens, Water Gardens, Formal Gardens, Coastal Gardens, Front Gardens, Roof Gardens, a dozen more). Then a large amount of pages are devoted to garden features, such as pergolas and arches, patios and paving, walls and fences, beds and borders, to name a few. There isn’t much covered in a one- or even two-year university landscape design program that isn’t in this book. Yes, there are many plans listing plant material that wouldn’t last up here in the north any longer than it would take to unload it from the truck, but that’s fine. Good design principles work regardless of USDA Zone. I cannot possibly live long enough to steal every idea shown wonderfully in this book, but I shall try.